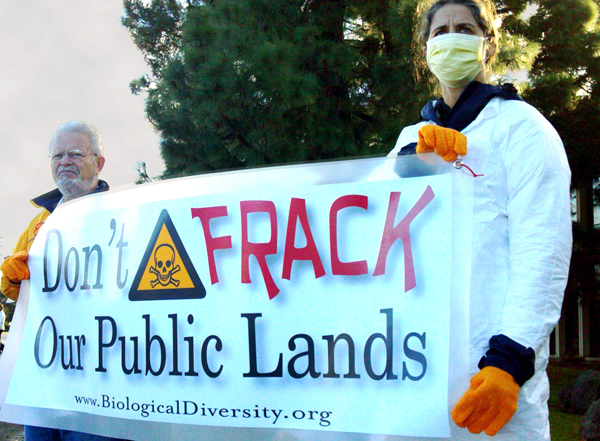 SAN FRANCISCO— The Center for Biological Diversity went to court today to compel California regulators to enforce an existing state law that should protect people and the environment from hydraulic fracturing, or fracking, a rapidly spreading new method of oil and gas extraction. The lawsuit filed this morning in Alameda County Superior Court says the California Division of Oil, Gas and Geothermal Resources has allowed fracking to expand without legally required oversight. California law applies safeguards and disclosure requirements to any underground injection carried out by the oil and gas industry, the lawsuit points out, and fracking clearly involves injection. Yet the state does not yet regulate or even monitor this controversial practice. Fracking involves blasting massive amounts of water and industrial chemicals, mixed with sand, deep into the earth at pressures high enough to crack apart geologic formations, causing fractures that let oil and gas move into the wells and to the surface. More than 600 wells in at least nine California counties were fracked in 2011 alone, and recent advances in fracking techniques are driving a growing interest in the Monterey Shale, a geological formation holding an estimated 14 billion barrels of oil. Reports have documented the dangers of fracking, including more than 1,000 instances of water contamination around the country. Fracking also emits hazardous air pollutants and methane, a potent greenhouse gas. It has the potential to induce seismic activity in one of the nation’s most earthquake-prone states. California’s existing oil and gas regulations cover all forms of underground injection and clearly apply to fracking. While fracking was exempted from the federal Safe Drinking Water Act in 2005 by what is known as the “Halliburton loophole,” no such exemption exists in California law. Compliance with California’s existing oil and gas regulations would require public disclosure of all fracking chemicals, as well as engineering studies and tests to evaluate the potential for underground migration of fracking fluids. State regulators would also need to ensure that fracking is conducted in a way that prevented, as far as possible, damage to life, health, property, and California’s water and other natural resources. In response to growing public concern, state regulators have issued a “discussion draft” of new regulations that would cover fracking; but these regulations have not yet been formally proposed, much less finalized. ← Willits Tree Sit to Stop CalTrans Is Still On! Clearly fracking needs to be stopped, but as there is no political will to do this, what can the few of us who really give a damn about protecting this planets health, what can we do? Hi Alex- I agree there is not the political will necessary for a broad social movement to stop fracking- that’s part of the underlying philosophy of Deep Green Resistance. So, knowing that the majority of people are not going to do anything, and there is no chance of salvation from legislation, we believe the only real option left open to us is direct action against the infrastructure that enables destructive processes. For fracking, a simple, off the top of my head list might read something like -1) the electricity for each fracking well- without it, i bet the well doesn’t work. 2) I don’t know where the toxic sludge they pump is produced, but I bet I could find out- that production site is probably a choke point that, if shut down, would stop the flow of fracking liquid to a number of sites. 3)the toxic mess has to get from point A to Point B- does it go by plane, train or automobile? either way there’s another supply line to cutoff. There are many ways to accomplish those goals, both aboveground and below. If you haven’t yet read the book Deep Green Resistance, let me suggest it as a starting point, or read the “Strategy” page. I believe that 20 people, thinking like a resistance, can stop fracking from ever endangering the central valleys water supply.